This uniform is dated 1979. It is a US Army (Air Force? 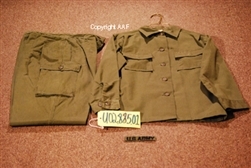 ), "Shirt, Women's, Utility, Durable Press, OG-507". This work shirt was worn in the field for work type purposes. It was not worn for more formal dress type occasions. This utility shirt belonged to a WAC woman, Corporal. Included with this utility uniform are a 1975 dated pair of "Slacks, Utility, Women's, Cotton OG-107". The name tape has been removed as is common, but easy to replace. The US Army tape has also been removed, but is included with this grouping. The condition is VERY GOOD, however the rank stripes have been removed leaving a rough outline. The stripe shadows appear to indicate that this woman many have been in the Air Force and not the Army. This uniform was literally dropped at our door step, with no other information. Presumably it came from a local female veteran.